Functions receive inputs from their parameters, and give outputs using their return values. But functions can also have inputs and outputs that aren’t immediately obvious. When we run it, it sings us the lines of the song. Like any good campfire songs, row row row your boat is good fun to sing with your friends. What happens if we try to run “sing” more than once? When we run the code, the first singer steals lines from the others before they can sing them. That doesn’t happen in real life! “Sing” uses a function called “splice”. Splice returns items from the array that allows us to pick out the first line of the song, but it also has a side effect. It removes items from the original array, which makes our “sing” function remove lines of the song as it sings them. We’ve written a function that is a bad citizen. The function changes data that doesn’t belong to it, and when it also depends on that data things go wrong. We call these actions “side effects” – when functions change data outside of their own scope. I’ve fixed the “sing” function to read the lines of the song using a parameter, and to use “slice” instead of “splice” which does not remove items from the original array. When we run our program again, all the lines should be sung as we’d expect. By breaking code into simpler inputs and outputs, pure functions are easier to understand. They are testable, because they always give the same output for a given input. They are flexible, because they have no state of their own and can be used anywhere in your code. What if we wanted to sing the next verse with a dog instead of a cow? Let’s write a special function called a curried function to do that for us. Currying allows you to write a function that is run in two stages. You call the function the first time to pre-program settings for later, such as text to search and replace. It then returns a function that can be called later to perform the searching and replacement. It’s really helpful when iterating over data and changing it – like changing words in a song. When we call the function the first time, the settings we give it are saved for later. It doesn’t replace anything right away. 0: "Old McDonald had a farm"
1: "E I E I O"
2: "And on that farm he had a dog"
3: "E I E I O"
4: "With a moo moo here"
5: "And a moo moo there"
8: "Everywhere a moo moo"
When we pass it into map to iterate over the lines of the song, the second part of the function leaps into action and replaces the words using the settings we saved earlier. This example might not seem like anything special on its own, and that’s okay. What is really magic is how functions allow you to re-use and combine code. Did you notice in my last example that we’ve replaced “cow” with “dog”, but the dog is saying “moo”? Let’s fix that. This function takes two functions as settings, and returns a function for later use that combines them both. This allows us to compose a single function that replaces both the name of the animal, and the sound it makes without writing a new function especially to do that. Now if we run iterate over the lines of the song using this new function, we should see the correct result. 4: "With a bark bark here"
5: "And a bark bark there"
8: "Everywhere a bark bark"
Breaking down code into smaller, single-purpose functions has allowed us to combine and re-use them. This spares us the effort of writing, testing and maintaining lots of specialised functions. If we wanted to make a new function to replace “cow” with “chicken”, and “moo” with “cluck”, we can do this without having to write a suite of new unit tests. 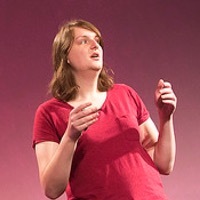 Katie Fenn is a software engineer with ten years of experience working with JS, CSS and PHP. She is usually up far too late working on open source projects or playing video games, and up far too early watching motorsport.